but don’t blink when we bleed. I have recently been lucky enough to be asked to write some lyrics for a musical project I am very excited about.. but more of that some other time. For now I want to share these lyrics that I hope will make a fine song. I’m putting these on this blog because they are that little extra bit more personal. I have been doing some editing and re-writting of some of my stories recently to basically ‘cut out the bits people skip’, as I believe Elmore Leonard has said. Below is a re-working of the story “Freedom” which I hope is a little less heavy on explanation and a lot less preachy. “Some things cannot be rehabbed,” said Dr. Considine with a practised tone of slightly frustrated professionalism. It was one of his chief gifts that he could not be frustrated beyond a certain, very specific point no matter how ridiculous or annoying the questions or demands of his patients became. If he were to honestly advise a medical student on what was the most important skill a physician could cultivate it would be this attitude towards the clients, delivered through that all important tone of voice. That; however, is something he would never do. The doctor understood the limits of his own energy and interest as well as he understood the limits of medicine. He had no interest in passing on the little bits of practical wisdom a long career in general practice had afforded him to anyone. People had to learn their own lessons. “We can certainly manage pain,” the doctor continued, stealing a quick look at the office clock and realising the ten minutes he had mentally assigned to this patient were fast running out and it didn’t look like said patient was anywhere near ready to get out of the chair on which he had sat, quite still, since he had entered the doctor’s office to get the results of the various scans he had recently undergone. The doctor had actually got out his anatomy books earlier and read up on the anatomy of the jaw just to be in a position to throw some impressive terms at this patient in order to convince him that his questions had been answered, even if he might realise later that he hadn’t understood what had been said. Importantly, this realisation would normally come after a patient had left the doctor’s office. This was another essential medical skill. It was no good however; this was not going to work with this patient; the one at this moment fixing him with the steady stare of his grey eyes from across the desk. This patient was a type that he found particularly difficult. He had a bucket load of questions and an intensity which Dr. Considine found disconcerting in the extreme. Even the way that he sat so upright in the chair, such a studied good posture, got under his skin. The patient said nothing but breathed in and out audibly once and appeared to be considering his next utterance. That silence, though it threatened to be brief, was a relief of sorts. The doctor did not like this patient’s voice – slow, deep but mostly deliberate. It never slowed up or got any faster though it could get more intense by a mechanism the doctor had not learned of in medical school. Perhaps much of the quality of his voice came from a nose that had been repeatedly crushed and broken and the doctor shouldn’t have let it get to him but it did and it seemed to be more than that. In case he was about to ask a question the doctor cut him off on instinct. Marc Babel still did not show any particular signs of being about to move. The doctor could tell he had not shocked him into leaving to make room for the next patient, thus getting Dr. Considine that little bit closer to the end of his day. No, he wanted to look at the x-ray again. He wanted to discuss physical therapy and acupuncture. He wanted to talk about changes he might make to his diet in relation to the management of inflammation- this not withstanding the fact that Babel was a long time vegan and completely unwilling to alter that to even the smallest degree. All the questions came now in a steady stream with that equally steady voice. The doctor sat, enduring the questions, waiting for his opportunity to speak. There was a long pause. Babel’s mouth tightened, then relaxed. “Surprisingly easy in the end”, the doctor thought with some relief and he directed a long and loving look at the clock. Outside the doctor’s office Marc Babel stood by his car with the key in the door and became lost, not in his thoughts but in an attempt to formulate any thoughts adequate to his situation. Since he had lost his last fight, by technical knockout, his jaw had been in constant, low-level pain and he had been prepared to hear of a break or a fracture which could be fixed with surgery and rest, something that he could work to rehab, not this apparently long term preexisting deterioration, not this slow death sentence for his career and by extension for his personality. He felt as if his mind was frozen at just the moment it needed to be at its most fluid and responsive. For a fighter this was the very worst frame of mind; when you freeze, stiff and still, you are a sitting duck, an easy target. A car passed by slowly and the reflection of the sun from its windscreen hit his eye and broke his trance. He drove home automatically. As he opened the door to the kitchen he looked at the clock to see how much time he had before he needed to go pick his daughter, Sashka, up from school. She was six years old and school was out at three fifteen. He still had nearly an hour he realised as Rimma, their dog, padded over to him wagging his tail in greeting. Rimma was a large, seven-year-old mongrel, part Labrador, part Bull Terrier, with maybe some Ridgeback in there, Babel had adopted from an animal shelter. He had chosen the dog for three reasons- Sashka had immediately fallen in love with him, he was full of energy and perfectly suited to be an athlete’s dog and because his age meant that it was very unlikely that anyone else would take him. The fact that the dog turned out to be the best advisor and counsellor he had ever known was an unexpected bonus. If his life to that point had been some kind of cliché, well, it need not be that way from now on. Not that his life had been that bad but it seemed to him that it was basically interchangeable with the lives of a lot of other kids of his age and background. Now he had a chance to build something more individual for himself. That was basically the tone of his thoughts as he wandered home from his first Brazilian Jiu Jitsu class roughly ten years ago. It was a long walk home and he could have, would normally have, taken the bus. He was sore too, beaten up but he had just discovered something new and fascinating; he had just fallen in love and he wanted to savour that feeling. He could wait a while before he got back to real life. Marc had decided to take the class having begun watching VHS copies of the earliest American Mixed Martial Arts competitions. These competitions allowed martial artists of any background to compete against one another with few rules in order to answer the almost age old question of just what worked and did not work in one-on-on, hand–to-hand combat. Crudely put- which martial art was the best? These early MMA bouts were shocking, bare knuckle affairs with very few rules that took place inside an intimidating cage with locked doors. No biting, no eye gouging and otherwise everything was in. They were as close to truly No Holds Bared as it was possible to be within the law. In fact it occupied both sides of the legal line at different times and in various states. Marc was mesmerised from the first fight he saw. The reality of a smaller man who, when he entered into the eight sided steel cage in which the fights happened inspired nothing so much as genuine concern for his safety, beating a much larger one we had feared only moments before would destroy him in a hideous mismatch, the brutality and the brilliance (he forced his opponents to submit with a series of joint locks and chokes rather than beating them to the much anticipated bloody pulp he had seemed destined for himself) was all the dreams of Bruce Lee movies come to vivid life. Marc had almost immediately decided he had to find a class and learn this art. At that time there were not many classes to be found in BJJ and he was lucky to find a blue belt teaching in the YMCA. He was scared when he first walked through the door, more of the unfamiliar social situation than of the idea of fighting but very quickly he was lost in the movement and immediacy of the grappling. Most importantly he was finding it was an opportunity to express himself honestly. When he sparred in class, although he was like a child amongst adults at the beginning, he thought of nothing else. He had no anxiety and he was completely at home with the realisation that he was totally responsible for himself, making decisions within an instant feedback loop. Make a mistake and you found yourself getting choked. Tap and start again or go unconscious, the choice was yours. You could not fake anything here. When you became fatigued and then exhausted you had to face it. Did you stop or push a little farther, it was up to you. You had limits and weaknesses; they were shown to you over and over. People were stronger than you, faster than you, better at this than you. How would you react, up to you. On that walk home (“All the best thoughts come to those who walk”, said Mr. Nietzsche and I suspect he may have been referring to the most nourishing thoughts rather than the smartest ones) he saw a future for himself that he could live with pride and that is the most seductive type of thought a boy of his age and background could have. It was a thought that shone like a bright sun lighting a path before him where before there had been none. That was more than ten years ago. He was nineteen, working part-time in a restaurant and racing BMX bikes. As he walked he was looking back on a life that began in the suburbs of Detroit in the winter of 1984 in the home of Saul Babel and Mary O’Shea. He of Russian Jewish stock and she of Irish descent they had married, she had not changed her name, they had one child and tried to be progressive and positive in their life together. They were both self-educated educators. They read a great deal about child development and though they were not inclined to be passive in their son’s education and they exposed him to art and philosophy they also felt that he would benefit most from attending public school in the very ‘real’ area of Detroit in which they lived. Those schools were simply rough and the teachers spent most of their time and energy just keeping basic order in the large classrooms. As Marc grew older he became painfully aware of how much time was being wasted and how little education was actually taking place. He became more and more alienated from that form of institution, particularly angered by how much the institution genuinely feared the children. There was a palpable sense of dread as in a prison with too few guards that has just banned smoking. He didn’t fight much in school because he was never really big enough but he withdrew more and more and tried to find his place among the BMX bikers and skateboarders who accepted and reinforced his attitude against fitting into straight society. ‘Straight society’ was a term he still allowed himself to use with a straight face- but only just. That was the boy who discovered that fighting could be the most beautiful, honest and decent way to discipline and shape his life and character; and then to express that life and that character. Fighting was an endeavour that allowed you to be totally responsible for your own actions and their consequences and that seemed, paradoxically, to open a door to freedom. Marc kept training, kept fighting and kept improving. He turned professional, started to make a little money and moved to LA to train and fight full time out of one of the large, professional gyms that existed by this time. He worked hard. He found himself welterweight champion of a mid size organisation and then, in the normal, banal way that dreams come true was offered a contract with the largest MMA organisation in the world. Since then he had earned a reasonable living but he had lost nearly as many fights as he had won. A lot of fighters with his record would have lost their contract but Marc only lost close fights to top competitors and most importantly his fights were exciting. He was still a fighter people would pay to see but he felt that tide turning now. That fact might ultimately limit his career as much as his chronic injuries. Marc and Rimma walked briskly through one of LA’s parks. Really, this was how Marc was most at ease. He loved to be outdoors and moving. Everything worked best then. He still had his best thoughts at times like these; only these days he understood and appreciated that fact and it was integrated into his life and psychological outlook. He would happily speak out loud to the dog as he had often spoken out loud to himself when he was child. Rimma fixed him with a look of gentle understanding. Man and dog kept walking and talking and on the dark walls of their connected subconscious shapes were being formed. After the walk Marc jumped on his bike to cycle the short distance to his daughter’s school. He cycled steady and fast and arrived with some minutes to spare. He waited outside and felt good. Good from the exercise and good because he felt this was a good school and that Sashka would come out happy or if not then it would only be because of a normal child’s problems and not because she was being abused as he believed he had been by his education. That feeling was joyful- an ‘all is well with the world’ feeling. Technique training, sparring, strength and conditioning, weight management, training expenses, money, money, money- All these things were on Marc’s mind as he sat looking out the window with Rimma’s head resting in his lap. Not to mention the always present responsibility to his daughter. He felt lonely. It had been so long since Sashka’s mother had left that he wasn’t sure of his memory of their relationship. It was long enough ago that he could be nostalgic about it and imagine a little happy, traditional family around him and he allowed himself to indulge in that sort of fantasy sometimes, though never for too long. It was dark and outside the window the moon was full and beautiful in the sky. It made him feel slightly aged. The world was serious and beautiful and he was a warrior. He would fight at least once more and he would do it entirely his own way. One- He would definitely fight again. Two- It was clear to him that he would train exactly how he wanted for his fight. Three- It was equally clear to him that he would fight exactly how he wanted in this fight. Four- He would not seek or accept any sponsorship for this fight. Five- Following from point four he would make this decision and its implications definitively clear by printing “NOT FOR SALE” on his fight shorts in the place where sponsors names would normally appear. And so it was done. He only had to go about making sure the promotion would find him an opponent and give himself over to the process of preparing in his own way. His own way meant the hard way. Every aspect of the training, presentation (as far as that was under his control) and the fight itself would be an expression of his most authentic self. That was the plan. To carry that plan through with integrity would take a great deal of energy and perseverance. If he had a chance to choose how he was thought of; how he was seen and understood after he was retired, assuming anyone would remember him at all, this was how he would do it. This was the only way he could do it. He could at least stop wasting time and concern on fretting about money or his possible road to the title or his career procession- he could simply concentrate on being the martial artist he had aspired to being for years. Someone once told him he had too much imagination to be a fighter. Now was his time to represent his heart. He was reasonably financially secure., at least in the short term. He was happy and proud of what he had achieved so far in his career and in his life. Now was his chance to make some art from this fighting and although he was not arrogant about his achievements he did feel he had earned that opportunity. It wasn’t that he hadn’t enjoyed the journey and he didn’t really think of his career in terms of sacrifrice but still he felt he had built a foundation on which he was entitled to leave something of himself for others to see. The event was more frightening than the fight. Fighting was second nature to him at this point. Even when he was younger he had been able to tap into that reptilian area of the brain that perfectly projects a fighting mind-set when the cage door closed and the thinking, the planning, had stopped. He had never; however, got used to crowds. He had never got used to waiting for his time to walk out. He had never enjoyed the spectacle. He did not feel like an actor or performer. He was low down on the fight card due to his recent results, which was good in so far as it meant he would be on early. It was bad in a career sense but that really didn’t matter any more if his career was soon to end. He was fighting Jason Logan. Logan was another veteran with a mixed record. He was well known and appreciated for his aggressive style, particularly in the ground fighting. In the stand-up Logan would probably not be considered an equal with Marc in skill but he always came forward aggressively looking to clinch and wrestle the competition to the mat where the advantage might well be considered to be his. Babel was glad to be fighting him. He was someone he knew well enough to like and respect but he was not a friend. More important his style was challenging and likely to make for a tough and exciting fight. It was important for Marc to be aggressive in his striking but not to over commit and allow himself to be taken down. It would be very difficult to beat Logan from the bottom position on the ground. He would concentrate on his hands, kicks being more likely to open him up to being taken down. He would need to be crisp and sharp with his boxing. He would have to be patient, not look for a big, knock out shot. Rather he would need to let the knock out come. As he warmed up waiting for his fight to be announced he repeated mantra-like in his mind the phrase: “Just touch him.” He reminded himself of all the hard work in had put in during his camp over the previous ten weeks, of how well it had gone, or the fact that he felt good and strong and he was ready- ready perhaps to produce his masterpiece. The first round started well. The buzzer that began the fight had always been a most welcome relief to him from the torture of the anticipation of the fight to come. His hands were working for him, his timing was on. He landed solid combinations of punches on Logan’s face and body. Towards the end of the round he lost discipline for just a moment, over-extending himself with a straight right hand. Logan dropped under it and shot through for a powerful double leg takedown. Marc pulled Logan in his guard, a defensive position using the legs. Logan’s posture was strong and it was hard to keep him from posturing up. Still, Babel was doing well until very near the end of the round when Logan landed a good elbow on his right eye. The moment it landed Babel knew it had done damage and that it would swell. He was now on a clock before that eye would close and he would not be able to see strikes coming from that side. The second round started dreadfully. As he came forward at the buzzer Logan immediately drove for an early takedown. Babel initially fought off the double but Logan switched off seamlessly to a single leg takedown and brought Marc to the mat. Marc fought to regain his feet but Logan was strong and heavy on top no matter what he did he couldn’t get off his back. The time ticked past and Babel spent the whole round on his back. Logan didn’t get many strikes off and few of them landed cleanly as Marc defended himself well but late in the round an elbow landed perfectly and smashed his nose. As he went to his corner at the end of the round, with only one more round left, he knew that he had to win the third and final round or stop Logan if he were to win. He also knew that his eye was closing and that blood from his broken nose was running down his throat and that his breathing was going to become more and more difficult. He had learned his lesson from the second round. He moved well and picked his shots. Punches and low kicks landed. “Just touch him and the knockout will come,” he thought. But half way through the round he was once again taken down. Logan was so damn heavy on top; well he was good, and Babel had blood dropping into his right eye. He was basically blind in there now, just a swimming miasma. His broken nose was making it almost impossible to breathe and it added to the ordeal of trying to get Logan off him. More elbows landed and his face was buzzing with a horrible dullness that he knew would organise and solidify itself into pain once the fight ended and the adrenaline began to slowly dissipate. Worst of all he knew the fight was lost. He knew that no amount of effort or courage would get him back to his feet in the remaining time and he needed to knockout or submit Logan at this point to win. He looked at the clock, he looked up at the damn clock and saw his masterpiece slipping away one second at a time. One minute and fifty-two seconds was a real eternity and also a single blink of an eye as he struggled, knowing it was in vain but doing so anyway and felt his dream disappear and, as it felt in those moments, his life’s work come to nothing. After the final buzzer he felt empty. The terrible fact was that it hadn’t even been a very good fight. Trying to replay it in his head he was forced to admit that to himself. He had dropped into Logan’s dressing room to congratulate him and he had meant it but it had still kicked the last of his energy and hope out of him. Now he sat having his hands unwrapped and not listening to the doctor discussing his injuries. That didn’t matter now. How many times had he been hit in the head? How many times had he hit others in the head? He was a little more damaged than he had been before the fight, not too much more probably when the dust settled; the inflammation went down. What had he been doing all these years, writing the story of his life? He had hoped to write himself a free life in hard work and blood. He had tried to create freedom and the simple truth was he had failed. What decision already made was bubbling up from his subconscious? Was it the end of an era? God, what a dreadful cliché, and he would not end up back in cliché. He had spent the majority of his adult life fleeing from cliché. Perhaps he had mistaken a life free from cliché for one of actual freedom. Freedom, freedom., freedom, he had held that word in his arms for so long and held its reflection in front of him as a totem yet he had less and less idea of its meaning. All of a sudden it didn’t seem that freedom could be fought for or won. Perhaps you just decided to be free. No, another awful cliché. Everywhere you pushed you got punched in the face or ended in a cul-de-sac of words. No wonder it made you want to fight. The baby sitter would be putting Sashka to bed soon. Rimma would be with her now while she ignored the fact that her daddy was fighting. He looked at the clock. He had time to call her before she slept to let her know that all was well and he would be home soon. There would be time to think about the future on the way to the hospital. I am lucky to have been born with a natural desire to find mentors. Some of them you could call ‘heroes’; some of them you definitely could not but that doesn’t matter because ‘mentor’ is the perfect word. These are friends, teachers, actors, filmmakers, musicians, writers who, whether I have known them personally or not, have provided support when it was lacking and reassurance when success, however that was defined, seemed very far in the distance. When I was in my mid-teens my older sister had a boyfriend called Alan who had a truly great record collection. He would make compilation tapes for her and she would let me listen to them. I was introduced in this way to The Ramones, Patti Smith, The Violent Femmes, Pere Ubu, The Velvet Underground, The Undertones, Stiff Little Fingers and pretty much every other sound worth listening to produced between the US and Europe from the sixties to the eighties. He, knowing that my sister was fond of me and it was smart to be nice to me (in fairness he was a nice guy anyway) offered to make me tapes of music by whichever artists I found most impressive. One of these tapes had a song called ‘1969’ on it by a band called The Stooges. The song was repetitious, and simple but had a strength and energy, an honesty of tone and a perfect marriage of music and lyric that was magic for me at that age.. and still is now by the way. Now you don’t get to have a record collection like Alan had without being just a little bit of a music snob- and that’s ok. So when I asked for a tape of Stooges songs it was pointed out to me that I could be asking for The Dream Syndicate or Talking Heads or any number of far more sophisticated and ultimately better music- might I not reconsider? No, I’d take The Stooges please (accompanied by an annoying girlfriend’s little brother smile I imagine). 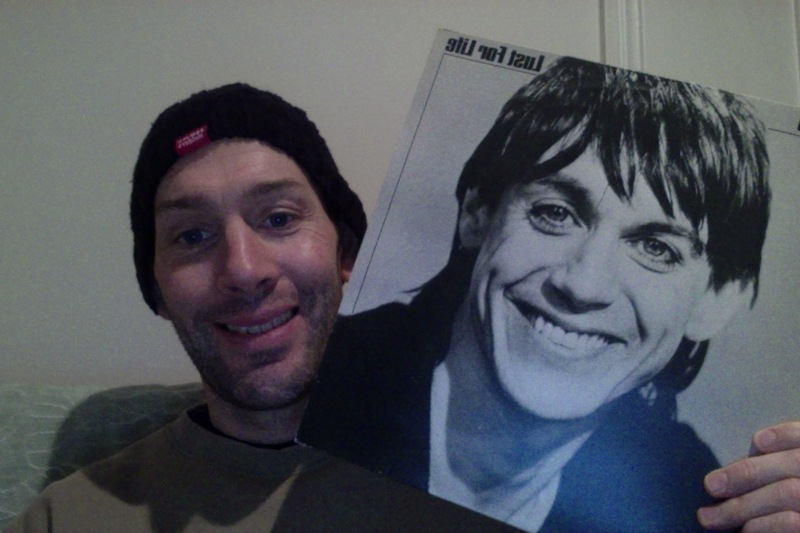 With that I got my collection and I learned about Iggy Pop, lead singer in the band and about his later solo career. I bought everything I could find as I could afford it. I got the first three wonderful Stooges albums, the well-known bootlegs like ‘Metallic KO’ and I continued to buy all the solo albums religiously. The solo albums were of patchy quality at times but that really didn’t matter, I had glimpsed something perfect and pure with Iggy at the right age and I was happy and proud to sponsor in a small way the person who had afforded me that experience. In “American Psycho” there is a chapter on what you might term Iggy’s mid-period solo career which is (begrudge and begrumble) a master class in irony. Last year I discovered that Iggy was doing a radio programme on Sundays for BBC 6 music. He revealed himself to have a better record collection than even Alan had and also to be a wise, funny, kind, interesting man with great stories to tell and a beautiful and inspiring attitude to share. There is a biography of the man called “I Need More”. Of course I bought it the first I heard of it and it isn’t bad but it is picture heavy and doesn’t give any real feeling of the personality. It would be very enjoyable to have an actual autobiography by Iggy himself because it is not just the facts of his life but his attitude to them and his storytelling which makes Iggy’s tales so wonderful. I can’t find my copy of “I Need More” now and it seems to be on sale for no less than a hundred pounds on Amazon. …to listen to whenever you want. It is a funny and fascinating meditation on a life in music and also on patience, hard work, passion and how to balance art and commerce not just in your career but more importantly in your psyche.